Taking big risks and seeing how they work out can be disastrous in real life—but it's great fun in games. We find that when a game forces you to press your luck to win, victory feels sweeter. (Defeat seems more bitter, too, but let's not focus on that). Published by Funagain/Sunriver Games, 3 to 8 players. 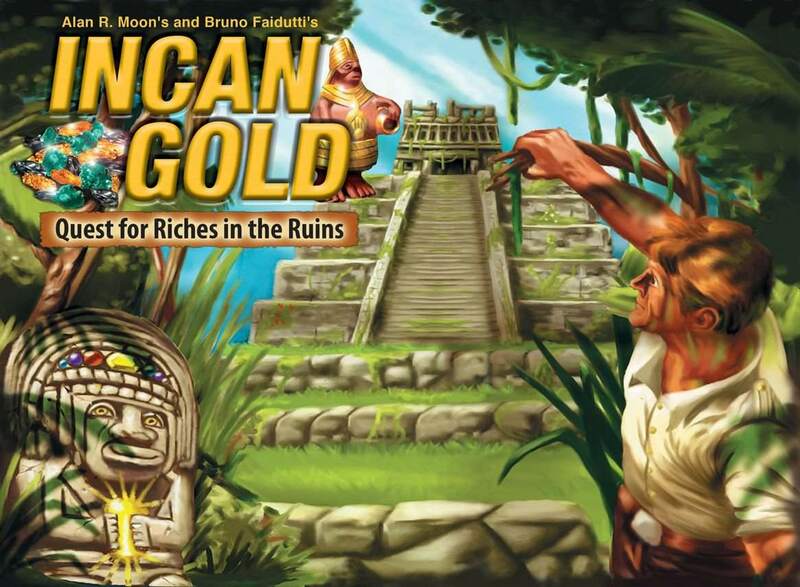 Heart-pounding decisions, thrills, heartbreak: Incan Gold has them all. Designers Alan R. Moon and Bruno Faidutti send gamers deep into a temple in search of treasure and hoping to avoid snakes, explosions. and other hazards. But if you venture too deep, you won't get out alive. Another great twist comes when players decide whether to return to camp: those who do might collect extra treasure, but it's worthless if too many returns simultaneously. Originally published by Parker Brothers, most recently published by Gryphon Games, 2 to 4 players. This gem from master game designer Sid Sackson is quite simply a must-play. It's amazing how much anguish can be caused by four dice. On a turn, you roll and split the dice into pairs. The board includes columns combinations from 2 to 12; the middle columns are much longer. Each time a roll matches a column, you move your marker up—but you can only use three columns per turn. If your roll doesn't fit those columns, you lose all your progress. The goal is to reach the top of three columns first. Published by Out of the Box Publishing, 3 to 6 players. Aaron Weissblum raises the stakes, literally. As the hot air balloon moves higher, a player rolls dice to see how hard it is to stay afloat. Other players then decide whether to stay in the balloon or jump out and earn at least some points. If the player who rolled can't play cards matching the dice, the balloon crashes and those remaining inside get nothing. Designed by Winning Moves, 2 to 4 players. When designer David Moffat first envisioned a game of tossing small plastic pigs across the table, friends may have questioned his sanity. But it works wonderfully. Players score points depending on how the pigs land. You keep rolling as many times as you want to, but if the pigs land badly, your turn ends with nada. Published by Rio Grande Games, 3 to 5 players. This fast-paced card game from Reiner Knizia challenges players to balance patience with the need to score. On a turn, you play cards from the draw pile face up. If you don't want to take an available card, draw a new one. But if that card matches one already available, your turn ends. The goal is to make matching sets of three. Published by Rio Grande Games, 2 to 7 players. In this press-your-luck game, also from Reiner Knizia, you roll eight dice, set some aside, then re-roll the remainder. Once you set aside some dice, you can't set aside that number again. (To be successful, every turn must include at least one worm roll.) When you stop, take a tile from the center of the table, or from another player. When all the tiles are claimed, the player with the most worms on his tiles wins. Published by C3, Inc., 2 to 7 players. 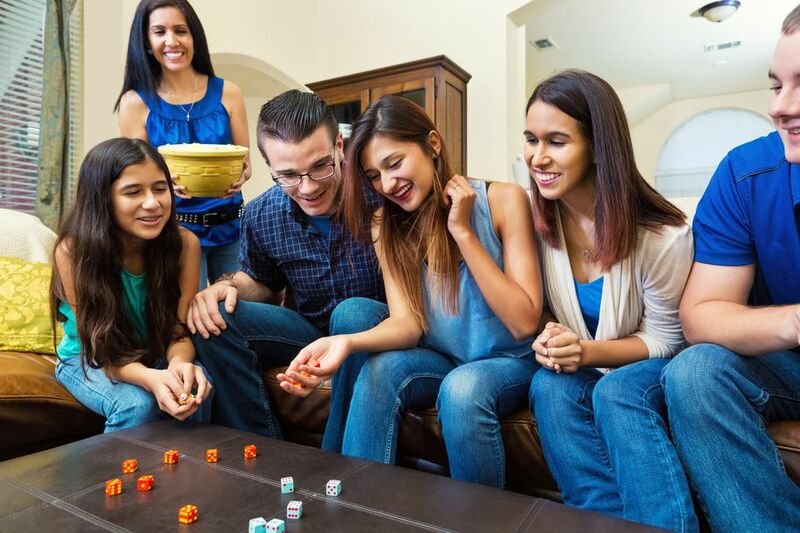 The five dice in this game are imprinted with various special symbols, and players roll them to come up with various scoring combinations. If you roll good combos, your score can add up quickly. But one bad roll will send you back to earth. Public domain, 2 to 4 players. If you’re stuck somewhere with one six-sided die, try Pig. Roll the die and add the number to any previous rolls. Continue rolling as often as you want—but your points evaporate if you roll a six before stopping. If you stop before rolling a six, those points can never be lost. The first player to 100 points wins. Published by Asmodée Editions, 2 to 10 players. Automobile racing is definitely a press-your-luck pursuit, and this game from designers Laurent Lavaur and Eric Randall elicit that excitement. Players keep their cars moving as fast as possible, but going into a corner too wildly will end your race. This game (another by Reiner Knizia) would be higher on this list except that it's primarily an auction game. At the end of most rounds, one player is confronted with a gut-wrenching decision: Should he continue drawing tiles hoping to get a better result, or stop before winding up with nothing?